If you are trying to find moving companies in Atlanta with outstanding track records for customer satisfaction, your search is over with Bulldog. Bulldog Movers has been serving the Metro Atlanta area since 1982, and in that time we have earned numerous recognitions and accolades. First and foremost, we are an A+ rated company with the Better Business Bureau and have earned a ProMover distinction by The American Moving and Storage Association. Our outstanding reputation for nothing less than complete customer satisfaction is the reason why we are also the only area local moving company to be a nine time recipient of the Consumer’s Choice Award. 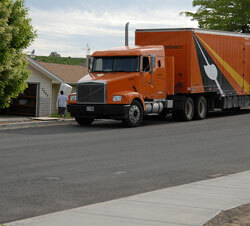 Our packing, moving, and storage services are simply unmatched, whether for residential or commercial moving needs. Our packing teams have all of the training and resources necessary to ensure items of any kind, from bedroom sets to office computer systems, are safely and securely packed for transport. Our moving vans are larger than those at other area movers and have all of the latest features for the smooth and comfortable transport of even the most fragile valuables traveling locally or nationwide. If you are trying to find moving companies with secure storage, you can count on the exceptional level of security in our 40,000-square-foot facility. Our moving proficiency has even earned us the title of Offical Mover of the University of Georgia. Still trying to find moving companies you can trust in Atlanta? We didn’t think so. Contact us today for more information. We proudly serve the entire Metro area, including Lawrenceville, Canton, Acworth, Marietta, and beyond.